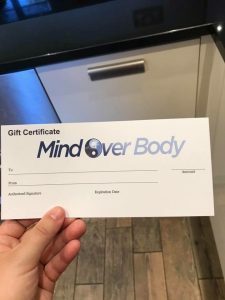 Don’t forget at Mind Over Body I offer gift certificates. This could be the perfect gift for a friend or family member. At Mind Over Body I vary my training styles and techniques on a regular basis so you never get bored. I have my own gym and outdoor space perfect for 1 to 1 training or group training. I am here to support you physically and mentally. Why not check out my website and find out a little bit about myself and what I have to offer.